Tom Cruise and Katie Holmes have arrived in Melbourne with their daughter Suri in preparation for filming of Holmes' new horror flick at Docklands. The couple's private jet was taken into an executive hangar at Essendon Airport. James Packer's private Crown Towers penthouse is said to be housing the family during their stay - after the billionaire offered up the lavish and super secure suite to his friends. 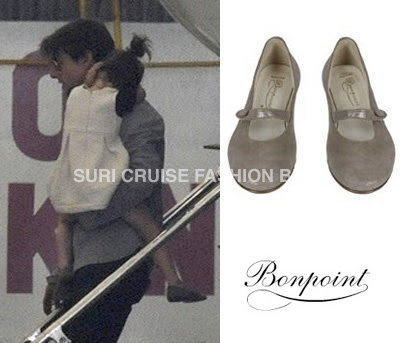 Suri is wearing Suede Ballerinas in Gris by Bonpoint.